Pestering you about your health like the second mom you never wanted. Which Type of Rebounder is Best? These are the cheapest trampolines you'll find. 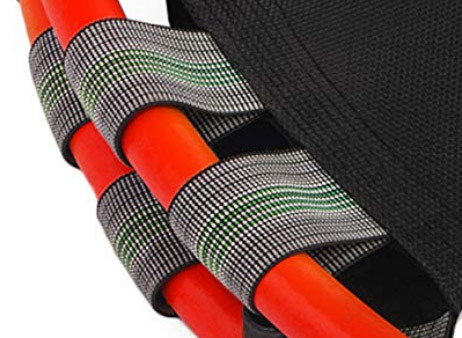 If it's under $80, chances are they use wide elastic bands, like an industrial version of the stuff you might find on some waistbands. From the reviews I've read on various models, these are great at first. Bouncy and invigorating like a rebounder should be Then, depending on frequency of use, they seem to degrade after about a year. The elastic bands rip, the mat gets warped and stretched out, and stitching unravels. The warranty on these things tends to be around three months. The theory behind the tapered shape is that it eases the bounce, allowing more give at first and then getting stiffer as the spring lengthens. This makes for a "bouncier" experience, while regular springs tend to be more jarring. The whole point of a rebounder is to make jumping low impact, so these cheap springs kind of defeat the purpose. 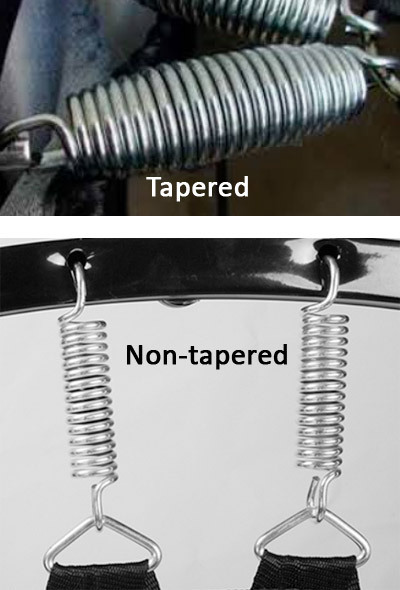 Another thing to consider is spring-loaded trampolines tend to be noisy since it's metal moving against metal. These use a whole bunch of bungee cords instead of springs. Like springs, they come in expensive and inexpensive models. My guess is the price difference is in the materials used. 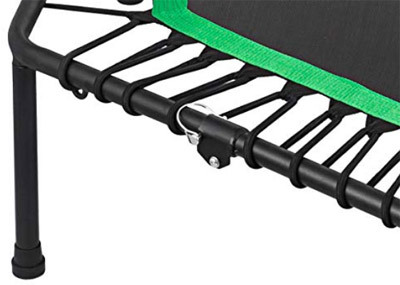 Lower gauge metal frames and thinner bungees bring down the cost and quality of the trampoline. In all the videos I saw where users compared a bunch of different rebounders, they tended to favor the bungees. They offered a softer, quieter, "bouncier" bounce. Rebounders come in two shapes: circle or hexagon. I saw these two types everywhere, yet there was no literature on the benefits of either shape. Why are there two kinds? I found one blog post that helped a little, and it basically said this: The hexagonal rebounder offers a bigger "sweet spot" for jumping springiness. On the other hand, round rebounders have a tendency to send the jumper back to the center if you stray off a little. That's the only difference I could uncover. In the end I decided shape was inconsequential and would not factor into my decision. I really hate noise, so the noisiness of springs is a big turnoff for me. I don't know if all spring rebounders are noisy, but the high end ones are pretty expensive, so I will probably lean toward the bungees. I'm going to stay away from the elastic bands because I plan on sticking with rebounding for the long term. I don't wan the thing falling apart after only a year. I'll update here once I decide on which one to get. If you're anything like me, you know the importance of exercise, but still hate doing it. What's an informed-yet-lazy geek to do? I recently learned about rebounding. I don't mean your boyfriend just broke up with you and now you're about to enter into an inappropriate relationship. Not that kind of rebounding. I'm referring to jumping on one of those fitness mini-trampolines. Wait, don't roll your eyes yet! Let's talk about all the ways rebounding is so great, then you can judge. You remember the lymph system? Exercise in general will get those fluids moving, but the up-down movement of jumping is one of the most effective methods of all. NASA wanted to find a way to help astronauts regain the bone density they lost in space. (Moving around in space is so effortless that the body start losing bone mass.) They found that jumping on a trampoline was 68% more effective than running. I've read user reviews on various trampolines saying they had back surgery or joint problems and found rebounding to be a very comfortable exercise for them to do. Unlike jumping on the ground, jumping on a rebounder cushions the landing like a set of good shocks. Okay, "fun" might be a stretch when we're talking about exercise. Especially if you're lazy like me. Exercise just isn't fun unless you like sports or something. BUT there is a certain fun factor that comes in when your flying up and down on a trampoline. It kind of reminds you of when you were a kid and jumped around just for fun. The brief feelings of weightlessness are kind incomparable to other onerous exercises. The rebounder does a lot of the work for you, but you still get sweaty and your heart pumps faster. You get all the benefits of exercising with a fraction of the effort required in other forms of exercise. If you're not familiar with the lymph system, read this post first to get acquainted. It's got the important job of clearing all the waste from your system. When it can't do its job properly, a toxic environment forms that encourages the growth of tumors. What to bras have to do with it? When they're too tight, they cut off the circulation of the lymph system. Women have an important network of lymph vessels around the chest and shoulders. When the breast tissue is unable to get rid of its waste material like the rest of the body, breast cancer could be the result. Several studies have been done on this. Read this account of one woman who discovered a lump in her breast. She stopped wearing a bra for a few months, and the lump disappeared! This French study proposed that bras actually encourage breasts to sag on their own because the muscles around them have languished. Interesting stuff! So if you can help it, toss that bra. If you must wear one for whatever reason, then try to keep it a little loose. If your bra leaves red marks, it's too tight. You hear it everywhere. Exercise more. It's good for you. But why is it good for you? If you're not in any sports competitions, and you don't even like sports, what's the point? I'm going to skip the parts about heart health, bone density, and that other stuff. In my mind, the single most important purpose of exercise is to clean out your body's sewer system. Ever hear of lymph nodes? They exist in your neck, under your arms, and numerous other places all over your body. They're part of the lymph system,which carries oxygen from the blood into your cells, and carries away the cell's waste. The waste travels along the lymph vessels (like blood vessels, but for lymph fluid) and eventually gets filtered out by the lymph nodes. Your blood is pumped around the circulatory system by the heart. The lymph system has no organ responsible for pumping the fluid around. It relies on one-way valves, the squeezing of the muscles around it, and certain other body movements. This means if you spend all day binge-watching your favorite Netflix show, your lymph system experiences hardly any movement at all. Imagine your toilet backing up. Gross, right? When the cellular waste is not dumped, it sits around your body stinking up the place and causing trouble. This also means your cells aren't being well oxygenated. Such an environment encourages the growth of tumors because the immune system isn't able to properly dump all the garbage. The immune system is responsible for clearing out malfunctioning cells, so when it can't do that, these malfunctioning cells get to hang around and multiply and basically go crazy. That's how cancer develops. See why exercise is so important? Move your body! Keep your sewer system clean. You'll live longer. I learned an interesting thing recently. Saturated fats are usually blamed for high cholesterol, but it's actually carbohydrates that are the culprit! Say what? Stay with me. I've got a layman's explanation for that. When you eat carbs, your body digests it and stores it as glycogen in your muscles. When it runs out of storage space there, it starts storing it in the your liver. When that gets full, the liver converts it into a form of cholesterol. The bad kind (LDL). Your body actually produces the majority of the cholesterol in your body. Reducing the amount of carbs you eat (bread, potatoes, pasta, crackers, cookies, popcorn etc.) will help you avoid this carbohydrate overflow. Humans haven't had enough time to evolve ways to effectively deal with the quantity of carbs we eat today, so helping your body avoid resorting to unhealthy ways of dealing with the excess carbs will encourage your good health in the long term.